For best results, listen on noise-cancelling headphones. Rehearsing Silence is part audio essay, part medical portraiture, part data sonification, part prosthetic design sketch. It proposes a binaurally-encoded, audio-based approach to portraiture that frames and compresses the gradual and inevitable diminishment of auditory perception as a consequence of aging and neurologically collapsing bodies. This design sketch stems, in part, from ongoing research focused on developing instruments and tools to support multi-sensory (non-visual) data analytics, and a continuing interest in how the effects of aging and sensory impairment manifest themselves as perceptual artifacts within an artistic practice (Claude Monet painted through cataracts, Beethoven composed through tinnitus, etc.). It also proposes an alternative approach to data sonification in which data is represented as absences, mutations, disfigurements or erasures of a previously whole or intact sonorous entity. Begault, Durand R. “The Virtual Reality of 3-D Sound.” In Cyberarts, edited by Linda Jacobson, 79-87. San Francisco: Miller Freeman, 1992. Eggermont, Jos J. Tinnitus. Springer, 2012. Gruener, Anna. “The Effect of Cataracts and Cataract Surgery on Claude Monet.” The British Journal of General Practice 65.634 (2015): 254–255. PMC. Web. 1 Feb. 2018. Lupton, Deborah. The Quantified Self : A Sociology of Self-Tracking. Polity Press, 2016. Mermikides, Alex et al. Performance and the Medical Body. Bloomsbury Publishing, 2016.
van Beethoven, Ludwig, and Paul Lewis. “Beethoven No. 3: Sonatas Op. 2, 7, 26, 27 ‘Moonlight’, 54, 57 ‘Appassionata’” (2005), Harmonia Mundi. Related post: Sonification sketchbook: A sonification model based on variations or mutations of single sound objects? Shh! is a sound installation for a single audio speaker in a public space. It consists of 24, 1-hour tracks running continuously in the space at an overall volume level which matches the ambient sound level of the space. A good shushing (like your grandmother probably used to give you), is like an arrow shot through shared airspace. It pulls focus away from self-obsessed interior gazing and casts it out into the world, framing and punctuating the contribution each of us makes to the collective soundscape of the commons. A good shushing can also wake you up – if only for a moment – to the struggle that each of us experiences in trying to control our surroundings and be heard above the communal din. First presented by the Art Gallery of York University’s Audio Out exhibition series, October – December 2010. In this version, all 24, 1-hour tracks have been layered together to form a single 1-hour listening experience. The contents of each track was first mapped out to form a 24-hour cycle analogous to the changing dynamics of the site’s soundscape. The individual moment-to-moment placement of sounds in time was determined using generative processes then digitally rendered and arranged as a continuous, sequential playlist. Many elements in this work were first presented as part of (((Cocktail Party Effect))) ‘The Audio Waiters’, a guerilla performance project, produced and performed in collaboration with InterArts Matrix. Both of these works are available for presentation in other spaces and situations. 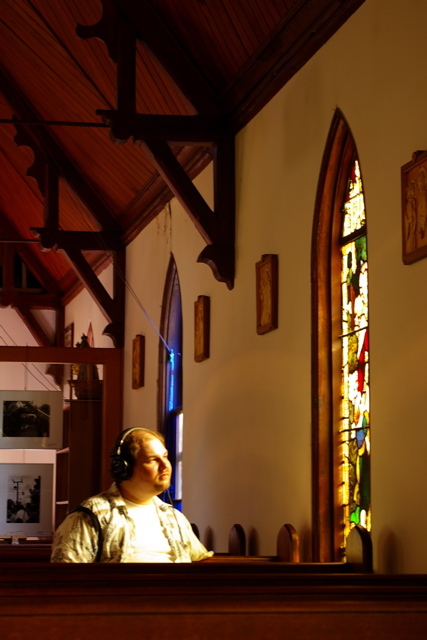 Presented at St. Andrew-by-the-Lake Anglican Church, Toronto Island in 2005, this immersive listening experience considers the impact of the city soundscape on physical memory and perception from the quiet solitude and sanctuary of an island church pew. 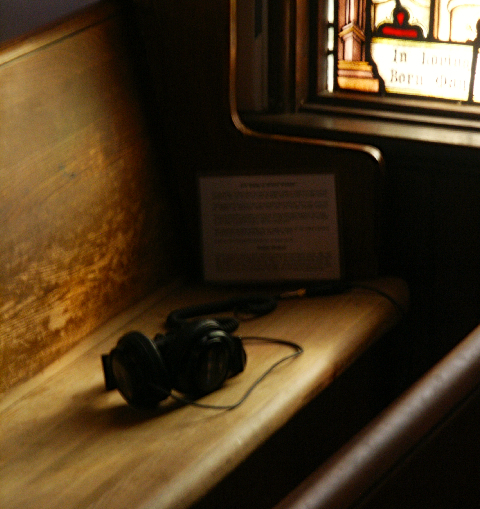 A single pair of headphones rest on a church pew, fed by a direct audio signal from binaural microphones affixed to the underside of the pew. The signal is fed to the headphones through a custom-built software program (built in MaxMSP) that simulates hearing loss, applying specially-designed filters and synthesized simulations of tinnitus to the signal. As this simulation eventually recedes, portions of the microphone’s signal are then delayed and looped, producing an experience whereby sight and sound gradually become unsynchronized. The above audio example is a direct feed of the signal heard through the headphones. For generations, Toronto Island has been an essential means of escape from the noise and pollution of the city. The pews of St. Andrews church, and many other island locations are commonly regarded as choice locations for experiencing both a quiet relief from the city, and moments of peaceful introspection. Still(ness) Ringing is an interactive sound installation exploring the impact of the city soundscape on physical memory and perception. 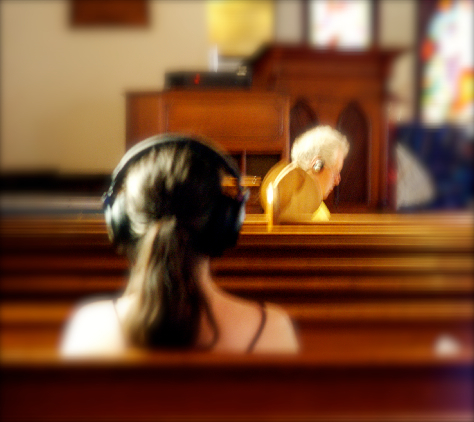 Situated in a single church pew, its goal is to provide participants with a heightened contemplation of those sounds which are commonly and irrevocably etched within the ear through prolonged exposure to urban environments. As a listening experience, ‘Still(ness) Ringing’ underscores the impact of this condition on the participant’s sense of personal connection with the outside world.